It’s the time of the year when it’s still summer and already autumn. If you cross the river Elbe in the morning steam rises slowly from the water. A layer of fog covers the hills but you know it’s gone in 30 minutes when the sun breaks through. The early morning and afternoon light is amazing, the sun sparkles through the trees and casts long shadows. Everything shimmers in a golden tone. But not every day is like this. Sometimes it rains for 24 hours and all you wanna do is stay in bed with a hot cup of tea. Or you start baking to warm you up and comfort you. Yeast baked goods are perfect for this. 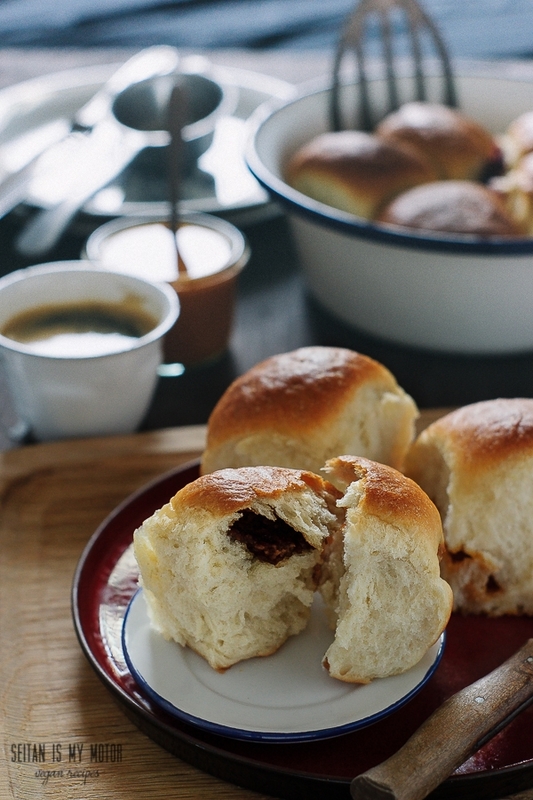 Sweet, warm, and soft rolls that you can definitely eat in bed if you don’t mind the crumbs. Buchteln are of Eastern European and Southern German origin, they are a kind of dumpling or baked doughnut. There are stuffed and unstuffed varieties, but I like the stuffed kind most. I usually fill them with sea blackthorn jam, with is probably quite a Northern German thing to do. Sea blackthorn berries are bright orange in colour and very tart, they often grow along the coast but I have seen some here in Dresden, too. Sea buckthorn jam has a very unique texture and taste. It’s usually smooth, silky, and runny and it has a slightly tart flavour with a hint of honey, conifers, and resin. If you can get your hands on it you should try it, but any kind of jam will work here as well. In fact, I split the buchteln because I couldn’t decide what filling to use. I filled five with sea buckthorn jam, five with blackberry jam, and five with speculoos spread. Combine soy milk, sugar, and coconut oil in a small pot. Warm gently over low heat until the oil has melted. Let cool until luke warm. Add the flour to a large bowl. Make a well and add the yeast (even if it’s instant). Pour the liquid mixture into the well and let sit for 10 minutes. Add salt and knead the dough well. It’s enough to knead this dough for 2-3 minutes. 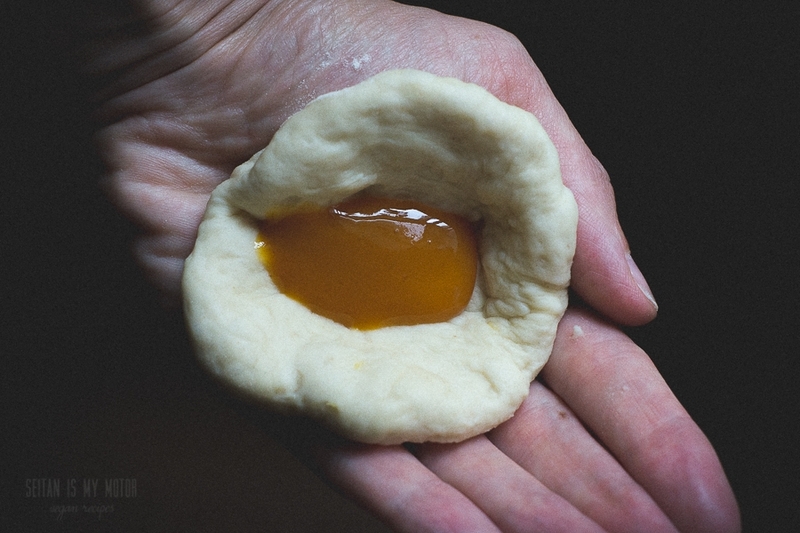 It should still be sticky and the gluten will continue to develop while you let it rest and rise. So don’t worry about it being sticky. Cover with a damp kitchen towel and let rise in a warm place for 45 minutes. Preheat oven to 180°C (350°F). Line a 18 x 28 cm square pan (7 x 11 inch) with parchment paper. Knead the dough for one minute. By now it should be smooth and not stick to your hands anymore. If it still does, add a little bit of flour. Divide the dough into 15 equally sized pieces and roll each into a ball. Place under a kitchen towel, so they won’t dry out. Take one ball and shape it into a flat circle large enough to hold one teaspoon of filling. Fold over and pinch the edges, then carefully shape into a ball again. Place in the prepared pan, seam side down. Repeat with the remaining dough balls. Cover with a damp kitchen towel again and let rise for another 30 minutes. bake for 25 minutes or until golden brown. Serve warm with more sea buckthorn jam or vanilla sauce. Yes, that’s no problem. You can fill them and do the second rise in the fridge. You could keep them there for several hours or over night. Just keep in mind that they should be brought back to room temperature before they are baked. This worked out amazingly! I wanted a fresh bake on Sunday a.m. for a brunch, but couldn’t work on it on Saturday, so Friday evening, I made it up to the second rise and kept it in the fridge. Sunday a.m. about two & and a half hours ahead of the brunch, I took it out and then baked it. Great success! Am now inspired to try a savoury filling to eat with soup since the Belgian summer hasn’t arrived yet. Thank you! How wonderful! I am so glad you like these. 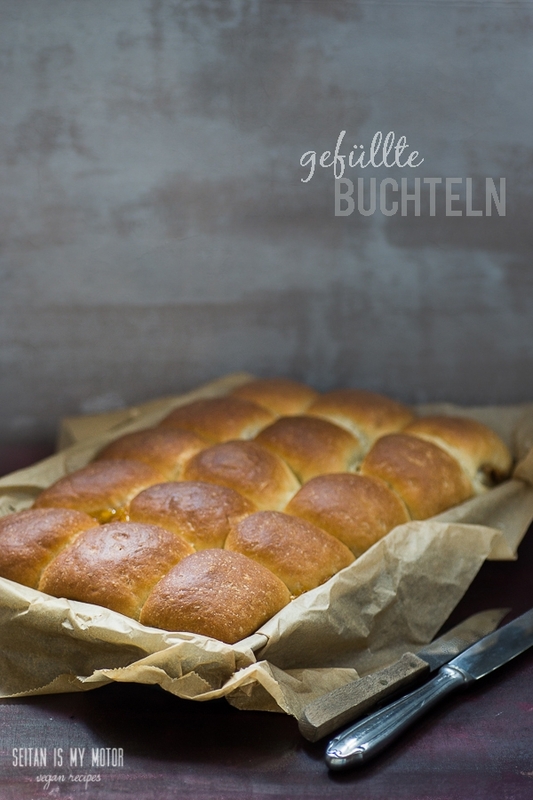 I have never ever heard of buchteln with a savoury filling, but it sounds so aweswome! Let me know if you ever try that. Hello! So, hopefully this isn’t an insult to German (vegan) cuisine! I made the buchteln dough again, and used a vegan brand of cheese (bio pizzaschmelz, from Wilmersburger) that I mixed with a bit of dried basil, a pinch of cayenne, and a few drops of oat milk (just to bring it together) as the filling. The rolls had a good texture, and it tasted really good with (vegan) split pea soup! But instead of 15, I made ten quite nice sized rolls. I used some oatmilk to spread on top and added a few sesame seeds, once they were shaped, during the second rise, so it browned really well. Personally, I think the sweetish (but not too sweet dough), with the lovely texture, and the savoury filling worked well to eat with soup. Quite a “comfort food” feel. I really don’t see how this could have been an insult! The dough is pretty forgiving and versatile, right? Great idea! Oh wow, you’ve got me craving fresh bread now. 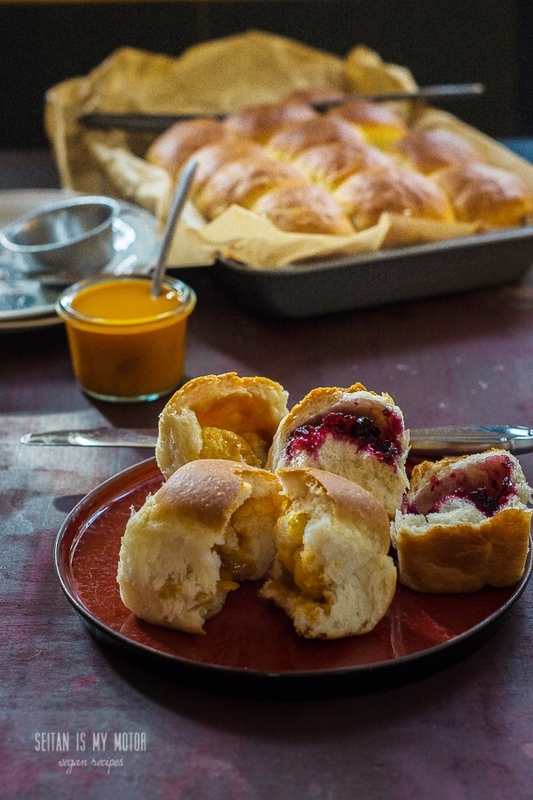 I don’t think I’ve ever had jam-stuffed rolls but now I want one! I think I’ve tried a sea blackthorn drink/cordial before but I’ll have to look for the fruit and/or jam. I don’t mind the crumbs! Bring on the Buchteln and coffee in bed! This is my kind of treat, soft and yeasty and filled with delicious sweet goo. Your photos are beautiful! Mmmm, these look right up my street. I love stuffed sweet breads. You can’t go wrong with stuffed breads. Oh how beautiful! They look so light and pillowy. I am always going to sign up for the stuffed version of something like this, it seems like such an obvious choice! I’ve never even heard of sea buckthorn – it sounds lovely! But, the other options are quite good-looking too! Ooh, these look so lovely and soft! I am bookmarking them for sure. My boyfriend loves anything doughy/bread based – particularly sweets. He’s been on a doughnut binge lately. Yum, I love sea buckthorn anything! We have them on the coast here too and I can get the jam and syrup at the local health food store. I should really try it in some home baked goods. Buchteln könnte ich auch mal wieder machen, die essen wir nämlich sehr gern! Auf die Idee unterschiedliche Füllungen zu machen bin ich bisher noch nicht gekommen, werde ich aber beim nächsten Mal ausprobieren.